Silahkan klik tulisan atau gambar untuk lanjut membaca America's Most And Least Favorite Chocolates. 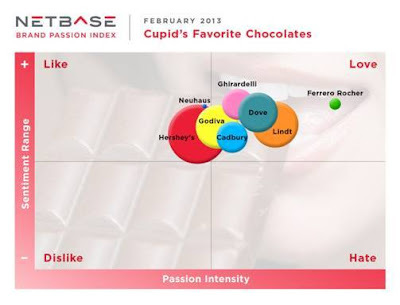 Research firm NetBase delves into the popularity of everyone's favorite Valentine's Day confection -- chocolate -- in its most recent analysis of online consumer conversations, which looks at big brands including Hershey's, Godiva, Ghirardelli, Ferrero Rocher, Neuhaus, Cadbury, Lindt and Dove. It found that Hershey's casts a wide net. The highest number of consumers chatted about the firm's wide range of products with 30 percent of the overall conversation, but not all of it was positive. Many consumers complained about the products' smell and the overly sweet taste of Hershey's chocolate. Despite the magnitude of chatter, Hershey's was awarded the second lowest score for Net Sentiment, which measures how positively consumers perceive the brand. Hershey's was also given a relatively low score for Passion Intensity, which tells how emotionally charged those feelings are. On the other hand, consumers expressed the most love for Ferrero Rocher's chocolates, followed closely by Ghirardelli. They liked Ferrero Rocher's gold wrappers and Ghiradelli's sea salt and caramel chocolates, as well as its peppermint flavored treats. It's worth noting that Ferrero Rocher earned a perfect Passion Intensity score of 100 and the highest Net Setiment score of 87 -- yet it represented only 1.3 percent of the overall chocolate buzz.